PALO ALTO, CA, September 11, 2018 – Striim®, provider of an enterprise-grade platform for streaming data integration to the cloud, today announced it has expanded its integration offerings for Microsoft Azure cloud services. 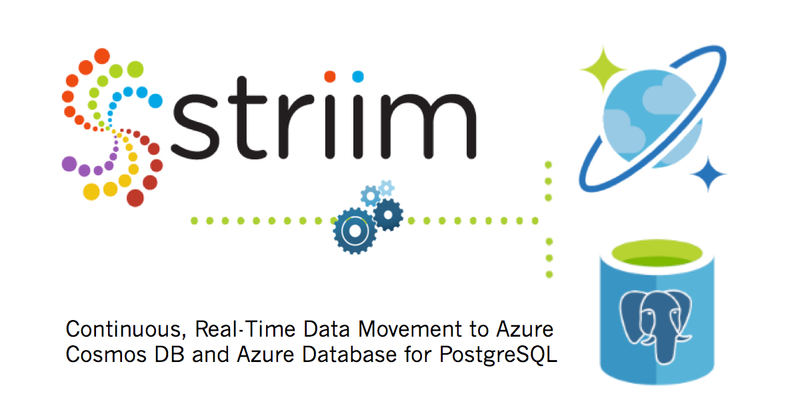 Striim introduces additional hosted solutions for real-time, continuous data movement from a variety of sources to Azure Cosmos DB and Azure Database for PostgreSQL. These new offerings extend Striim’s existing Azure marketplace solutions for real-time data integration to Azure SQL Data Warehouse, Azure SQL Database, Azure Storage and Azure HDInsight. “We at Striim continue to invest heavily in our data integration solutions for Microsoft Azure as part of our overall strategy to enable real-time hybrid cloud architectures,” said Alok Pareek, Founder and EVP of Products at Striim. “Customers are interested in adopting both NoSQL and SQL-based data stores in the cloud. With Striim’s edge-side, agent-based data capture, topology-based pipeline wizards, and strong ACID guarantees, migration to PostgreSQL from on-premise transactional systems becomes seamless. In addition, our continuous real-time feeds into Cosmos DB makes the latest data available for Cosmos DB applications using a familiar SQL API. Striim’s cloud-based services simplify the creation of real-time data pipelines from a broad range of database and data warehouse sources (via low-impact Change Data Capture or CDC), messaging systems such as Kafka, key value data stores, and distributed file systems like HDFS. With these data pipelines in place, companies can continuously stream real-time data into one or more Microsoft Azure cloud services, including new offerings for Azure Cosmos DB and Azure Database for PostgreSQL. Microsoft Azure Cosmos DB is a low-latency, highly scalable, schema-less NoSQL database that supports multiple APIs. Microsoft customers leverage Cosmos DB to transparently and elastically scale and replicate their data wherever their users are across the globe. With Striim, users can unlock data currently residing elsewhere – on-premise or in the cloud – and continuously deliver that data into Azure Cosmos DB to ensure they are always working with the most up-to-date data. For more information, visit Striim for Azure Cosmos DB, or contact us for a private preview. Azure Database for PostgreSQL provides fully managed, enterprise-ready community PostgreSQL database as a service, addressing the needs for high availability, scalability and security of PostgreSQL users. To further support these needs, Striim offers a secure, reliable, and scalable service for continuous real-time data collection (including low-impact CDC), preparation, and delivery to Azure Database for PostgreSQL. For more information, visit Striim for Azure Database for PostgreSQL, or contact us for a private preview. The Striim®platform is an enterprise-grade streaming data integration solution for moving data in real time to the cloud. Striim makes it easy to continuously ingest and process high volumes of streaming data from diverse sources (both on-premises or in the cloud) to support hybrid cloud infrastructure, as well as Kafka, Hadoop, and NoSQL integration. Striim can collect data from enterprise databases (using non-intrusive change data capture), log files, messaging systems, and sensors in real time, and deliver to virtually any target on-premises or in the cloud with sub-second latency. For more information, visit www.striim.com, read our blog at www.striim.com/blog, follow @striimteam, or download the Striim platform.